For D-Wave, the path to quantum computers being widely accepted is similar to the history of today's computers. The first chips came more than 30 years ago, and Microsoft's Basic expanded the software infrastructure around PCs. Quantum computers are a new type of computer that can be significantly faster than today's PCs. They are still decades away from replacing PCs and going mainstream, but more advanced hardware and use models are still emerging. "A lot of that is unfolding and will have a similar dramatic change in the computing landscape," Vern Brownell, D-Wave's CEO, said in an interview. D-Wave is the only company selling a quantum computer. It sold its first system in 2011 and is now pushing the speed limits with a new quantum computer called the D-Wave 2000Q, which has 2,000 qubits. The 2000Q is twice the size of its current 1,000-qubit D-Wave 2X, which is considered one of the most advanced computers in the world today. A price tag for the 2000Q wasn't available. The 2000Q is thousands of times faster than its predecessor and is leagues ahead in performance compared to today's PCs. The specialized computer, valued at roughly US$15 million, will first ship out to Temporal Defense Systems, which will use the system to tackle cybersecurity threats. 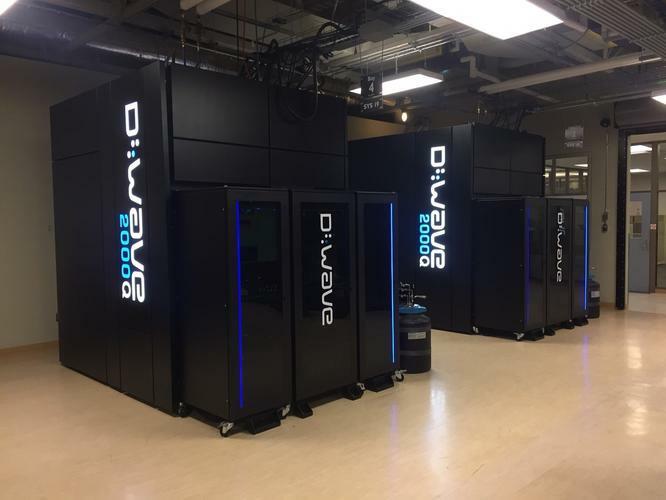 D-Wave's quantum computers are being already used by the Los Alamos National Laboratory, Google, NASA, and Lockheed Martin. D-Wave's goal is to upgrade all those systems. The ultimate goal is to develop a universal quantum computer that could run all computing applications, much like PCs, but researchers agree that type of quantum computer still decades away. But like PCs, users first need to start feeling comfortable with quantum computers, and Brownell hopes D-Wave's systems will ultimately be available to the masses via the cloud. IBM has already made its 5-qubit quantum computer available through the cloud to anyone who wants to play with it. "To really flourish we have to make it easy to consume," Brownell said. The cloud will provide developers with a headache-free way to play with qubits without buying the expensive hardware. There are many types of quantum computers under development, and D-Wave's system is based on the paradigm of quantum annealing. The computer delivers possible outcomes to a problem by deploying a magnetic field to perform qubit operations. IBM is working on a different type of quantum computer based on the gate model, which is considered advanced but more complicated to achieve. Microsoft is trying to make a quantum computer based on a new topology and a particle that is yet to be discovered. D-Wave and IBM were once squabbling, disputing each others' approaches to a quantum computer. But they are now showing each other respect and have a common goal of speeding up the release of quantum computers. A long-term computer replacement is needed as today's PCs reach their limits, and quantum computers could be the answer. D-Wave doesn't have a particular religious persuasion on what may be considered the right form of quantum computing, Brownell said. The annealer was a quick way to quantum computing and can be injected into today's demanding workloads. "We believe in all approaches. My belief in the future is there will be different types of quantum computers," Brownell said. The company's view is similar to using different types of chips like CPUs, GPUs, and FPGAs for different workloads, with each of them having their own benefits, Brownell said. Some applications for D-Wave's quantum computer include machine learning, financial simulations, and coding optimization. For example, the quantum computers could be used to build classifiers for better speech recognition or labeling of images, Brownell said. Algorithms play a big role in making D-Wave's quantum computers effective. "Our belief is that machine learning is the killer app for quantum computing," Brownell said. Quantum computers calculate differently than today's computers, which store data in the states of 1 and 0. Quantum computers use qubits, which can store data in the form or either or both simultaneously and in states beyond that. The qubit's flexibility allows quantum computers to do more calculations simultaneously. Quantum computers harness the laws of quantum mechanics to achieve various states, but qubits can also be finicky, which is why they have been a scientific challenge for decades. Qubits are unstable and can quickly go out of control, which could break a computing cycle. Researchers are trying to address issues by putting qubits in controlled environments and exerting more control over qubit behavior. Adding more qubits and new features, like quantum annealing control, has helped speed up and stabilize the D2000Q. D-Wave will speed up its quantum computers with more qubits every 18 months, a rough timeline that Intel follows to advance its PC and server chips. D-Wave is also trying to get programmers on board to write applications for its quantum computer. It has released Qbsolv, an open-source tool that can break down code to work with the quantum computer. The tool also has interfaces so applications written using popular machine-learning frameworks like TensorFlow and Caffe work with the quantum computer.